Mary, even Bruce Springsteen (whom I feel lucky have seen once in my life—35 years ago, and he was filling stadiums then! )—the opportunity has never been right and/or has rarely presented itself to see Linda. It could have happened just a week ago when she was in Washington for the National Book Festival, plugging her new memoir—on my birthday no less—but D. and I went to Philadelphia for the day to have dinner at one of my favorite restaurants. Another chance, perhaps the last, missed. I did buy her book, Simple Dreams: A Musical Memoir, and devoured it in a little more than a day. It's amazingly well written, if highly selective and a little imbalanced—a long, vivid, and transporting chapter on her childhood in Tucson followed by chapters of varying lengths tracking her career, dwelling on landmarks like the making of her breakthrough album, Heart Like a Wheel, and virtually skipping over some others, such as my all-time favorite of hers, Hasten Down the Wind. "The place where I grew up bore no resemblance whatsoever to the pictures in the little books I read as a child. I wondered what kind of a place would have such an abundance of lollipop trees and lush green meadows that didn't even have to be watered with a hose. Instead, we had the giant cacti known as saguaros. These enormous plant beings (I can think of no other way to describe them) grow within a few hundred miles of Tucson and no place else on the face of the earth. They are the cleverest of water hoarders and can expand their leathery green skin to capture as much as a ton of additional water. 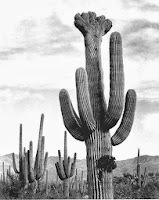 Saguaros produce an extravagantly voluptuous white blossom, which is the bravest gesture I can imagine in an environment so purely hostile to plant growth." —Simple Dreams: A Musical Memoir. Linda recorded "Keep Me From Blowing Away," from Heart Like a Wheel, in Silver Spring, Maryland, where I grew up. I find this is one of the most stunning facts in the book. She came down with the flu in 1974 while passing through Washington with a Jackson Browne tour and ended up staying behind to recover at the Bethesda house of John Starling, a member of the Seldom Scene whom she had met through her friend Emmylou Harris. A snowstorm came, and there was a houseful of musicians, one of whom was Paul Craft, who wrote "Keep Me From Blowing Away," which she decided to record as soon as she could—which in this case was at the nearby Silver Spring studio (who knew?) of the engineer George Massenburg, whom she ended up working with many times later in LA. I have no idea where in Silver Spring his studio was, but I love to think that I—12 years old and soon to be in the thrall of Linda Ronstadt—was probably no more than a few miles away from the creation of a piece of this seminal record. Linda is now probably as well known, if not better known, for her albums of American standards that she recorded in the 1980s with Nelson Riddle as she is for her country-rock and pop hits of the 1970s, but to me her work from the '70s will forever define her. She has not done anything since that has come close to that in my estimation, or that suited her voice better (with two exceptions, neither one a solo project: the first Trio record with Emmylou Harris and Dolly Parton and a great duet album she made in 1999 with Emmylou, Western Wall: The Tucson Sessions). Thinking a lot about her, as I have been over the last several weeks with the release of her book and the news that she's suffering from Parkinson's disease, I've come to realize that I actually felt betrayed and angry when, in 1981 (I was 19), she abandoned rock for a turn on Broadway in The Pirates of Penzance, which was followed by a less successful run in La Bohème at the Public Theater and then those standards, followed later by the hugely successful albums of Mexican songs. I'm undecided about including her next album, Mad Love (1980), in large part a trend-victim foray into new wave (including three Elvis Costello covers) that met with mixed reception but that I liked. 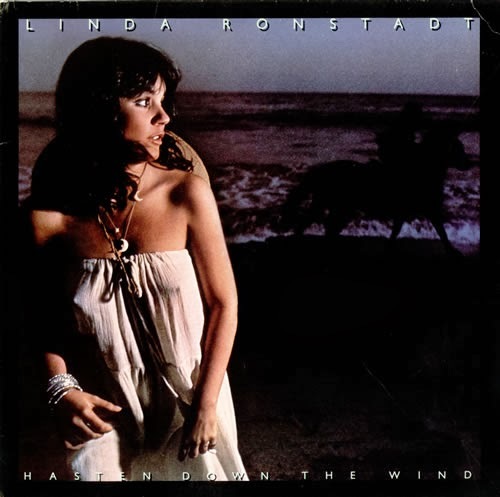 I guess I'd say it's part of my definitive Linda Ronstadt years (and the last of her records I bought for a long, long time) but stylistically not equal to the "canon." Likewise her pre-Heart Like a Wheel album, Don't Cry Now, has some lasting moments (including "Love Has No Pride" and "Desperado") but was mostly a hint of what was to come. Linda first came onto my radar with the inescapable Top 40 hits from Heart Like a Wheel, "You're No Good," "When Will I Be Loved." She remained merely a radio presence until one of my older sisters put Hasten Down the Wind on her Christmas list in 1976, when I was 15, and I gave it to her (probably about $5.99 at Kemp Mill Records in Wheaton, Maryland). My sister was into the Eagles, Jackson Browne, and Little Feat at the time, all musicians who were part of Linda's circle, but it turned out that I listened to Hasten Down the Wind more than she did. I played it all the time and never even had my own copy till she went away to college (it's even possible that I appropriated hers when her tastes moved on; I can't remember). The next Christmas, I got Simple Dreams from Santa. I was shy and solitary and didn't really socialize outside of school until I was a senior (I went to a private school and few of my classmates lived near me). My circle was my family, and because I was the youngest of four, my siblings were increasingly unavailable as they pursued activities of their own and then went off to college. I spent a lot of time listening to records by myself. Imagine a skinny 16-year-old kid who never went out or got into trouble tucked up by the stereo singing along to Linda's cover of Warren Zevon's "Carmelita"—Carmelita, hold me tighter. I think I'm sinking down. And I'm all strung out on heroin on the outskirts of town . . . .
My parents were wrapped up in their pursuits—my father in his books, my mother in her teaching and graduate work, so they probably didn't give lyrics like that much more thought than I did (even I didn't give them much thought)—but my mother came to like many of Linda's songs, especially "Blue Bayou" and (an early hint of Linda's later recordings of standards) "When I Grow Too Old to Dream." The prettier ballads were something Mom and I shared. Last weekend, when I was briefly considering going to see Linda at the book festival, I imagined what I might say to her as she signed my copy. "You probably have a lot of men telling you that you were a key figure in their adolescence, but I can tell you you were important to gay boys, too. . . ." Where I would have gone with that, I have no idea. It's probably just as well I didn't get the chance. The day after her appearance, I read Henry Alford's New York Times column on awkward celebrity encounters, in which "we want to parse or mediate an entity that is at once wholly familiar but wholly unknown to us; we want to touch the proverbial screen." What did Linda Ronstadt mean to a gay teenager in the 1970s? Like Stevie Nicks and Carly Simon, she was, for me, a fantasy on which to project my ideas of an unknown territory—but it was all about aesthetics, about sensation, not sexuality. The famous Annie Leibovitz red-negligee photo spread in Rolling Stone, the gauzy white dress on Hasten Down the Wind, Linda gazing off into the Malibu distance—these might as well have been scents of perfume (Charlie! Jean Naté! ), a mirrored tray of jeweled necklaces and silk tassels on a dresser, an overheard story about a first date on a winter night, the guy in a puffy down vest, the girl in Frye boots. A future I might someday see. They say just once in life you find someone that's right. But the world looks so confused, I can't tell false from true . . . . I've never felt it was cool to love Linda Ronstadt. I remember when we were teenagers, my brother made a dismissive comment about performers who "only" sang rather than writing songs and playing instruments. It stuck with me, and deep down I felt there must have been something deficient in Linda, and even more in my affection for her. But what I now know is that she has a musician's and scholar's knowledge of music history, harmony, instrumental arrangement, and the way the voice works. She also can describe a musician's particular qualities like a real writer. Here she is on Randy Newman, whose adaptation of Faust she sang on (and whose voice makes my own skin crawl, though I recognize his musicianship and songwriting skill): "Randy's songs can be bleak. Not to seem a hard man, he will insert a shard of comfort so meager it seems Dickensian. His songs are superbly crafted, with a musical tension that results from this combination of hope and utter despair. In his orchestrations, he might comment on the narrative being carried by the singer, using the instruments to deliver the jabs. Singing in the midst of one of his arrangements can feel like taking part in a boisterous discussion, with people of unevenly matched intelligence, sensibility, and insight ranting and squabbling." When I was in Vermont earlier this month, I read a New York Times article about Linda in which she discussed her Parkinson's and her forthcoming memoir. That was the gateway to all of this—she's been on my mind ever since. In a used-CD store in Brattleboro, I bought two of her later records I'd never listened to apart from a song or two. Feels Like Home (1995), whose beautiful title song is by Randy Newman, contains some good performances that could stand up to those of her '70s heyday ("High Sierra," "Morning Blues," "Women Cross the River"). We Ran (1998)—which turned out to be the last solo pop-rock album she recorded—is a lot more uneven. But I keep listening to them and will no doubt add others to my collection. Not having listened to her much at all for decades, I've started loading her '70s masterworks onto my iPod. I may one day give her American Songbook projects (Lush Life, etc.) more of a serious listen, or even her mariachi records. But for now the fancy getups, the mannered hairdos, the crinkly-nose smiles of those undertakings just don't interest me. Even as I find I'm more interested than ever in her. I've written a lot about having been a solitary, sometimes lonely kid. 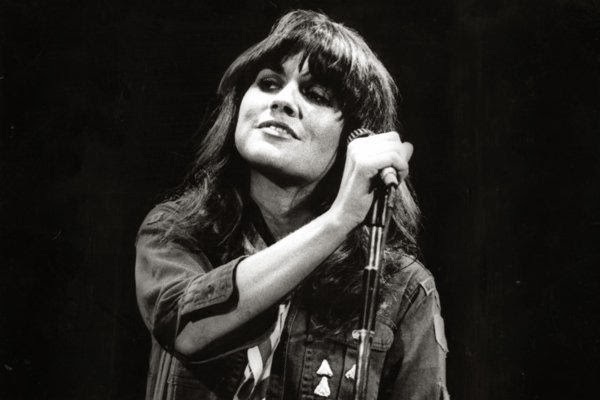 But thinking back on those days and my love of Linda Ronstadt doesn't make me feel sad or like something I want to distance myself from (though I did distance myself from it for a long time). I feel incredibly attached to this music. These are all really fond memories. I've never met anyone in adulthood who shared my passion for Linda—not my current partner, not my previous one, not any friends I can think of. I don't know why that is. She still has millions of fans, as the crowds at her appearances have proved. I just don't seem to know any of them. Linda is at a tough point in her life right now, no longer able to sing and dealing with a serious diagnosis, but here is what I've gleaned: She has a lot of friends, two kids she's proud of, an accomplished and varied body of work to look back on, a fierce engagement with issues she cares about, such as immigration, and—what I've never really appreciated till recently—the great respect of her fellow musicians. There's nothing deficient about her at all (or about me). In short, a life well lived, generously and unpretentiously, whose latest turn she seems to be facing with equanimity and acceptance. I wish her well. The biggest surprise: After all these years, I find I'm still growing into her.